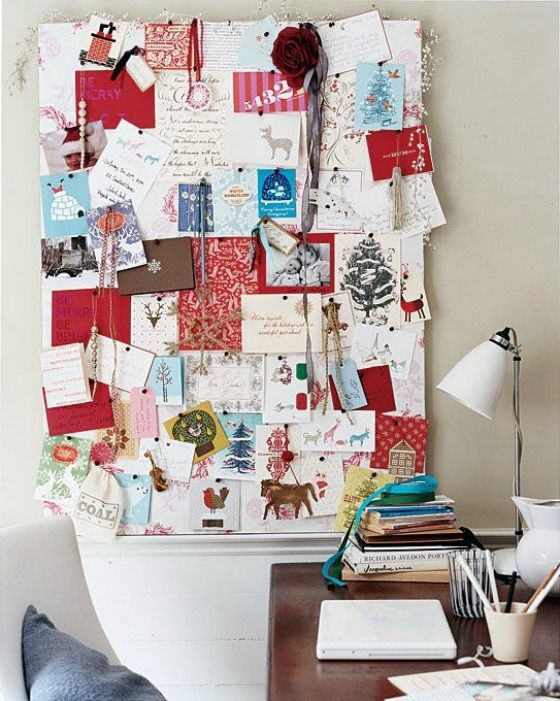 Most of us receive a lot of Christmas cards from different cities and even countries and storing them can make your home messy. 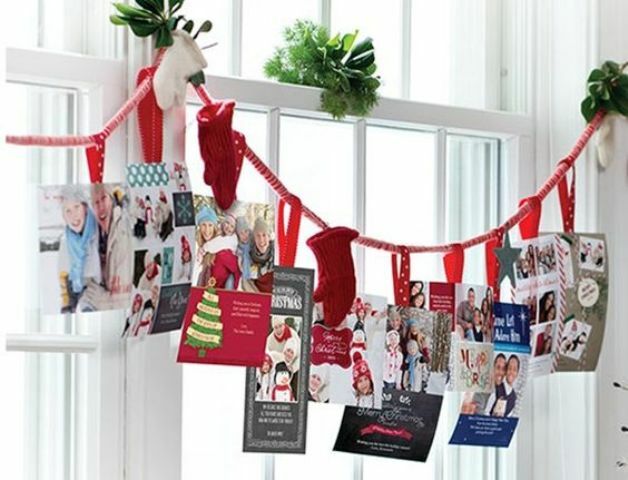 Display them in some cool way to keep your home in perfect order and to bring a festive touch to your home. 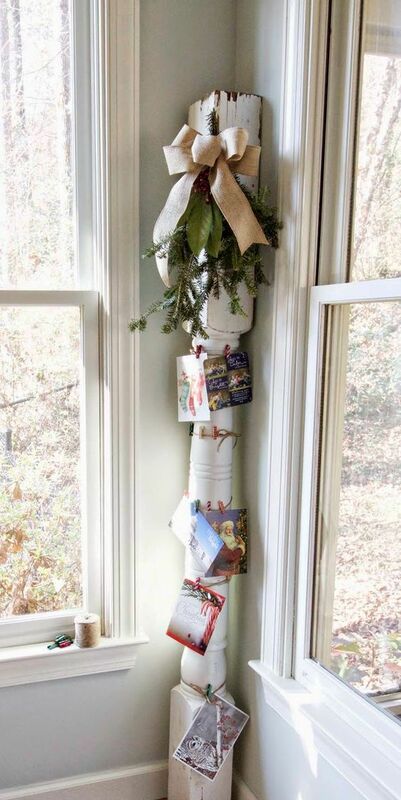 Don’t know how to do that? 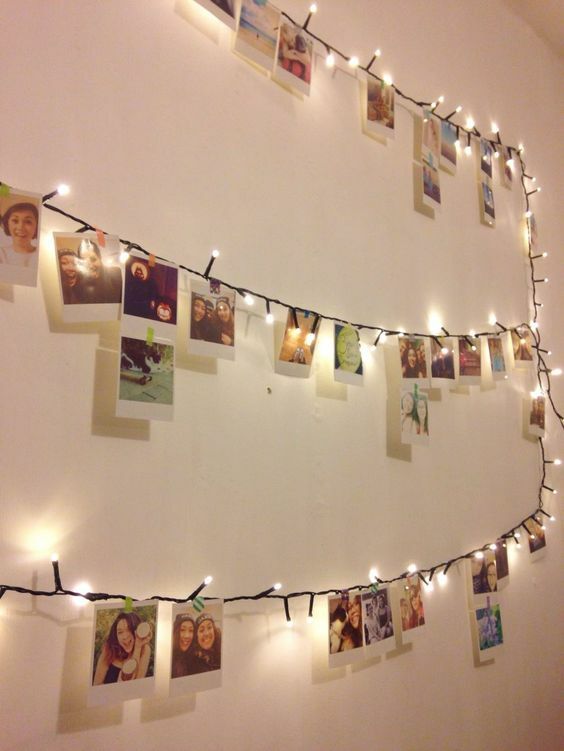 We are here to help you with a ton of ideas! 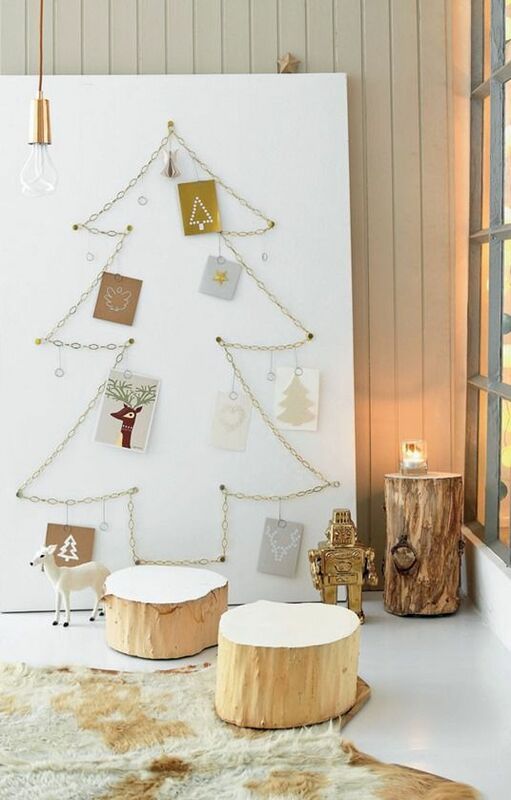 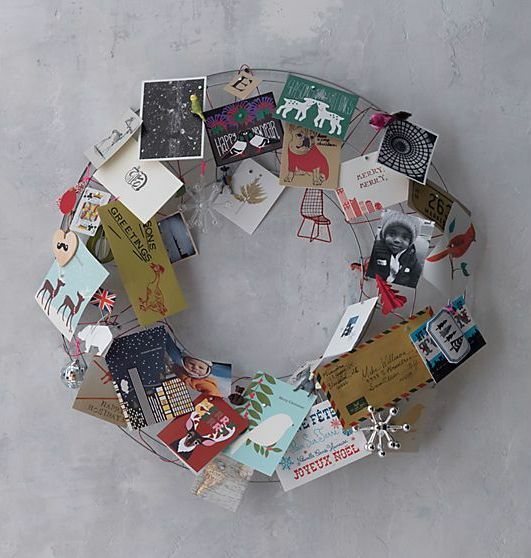 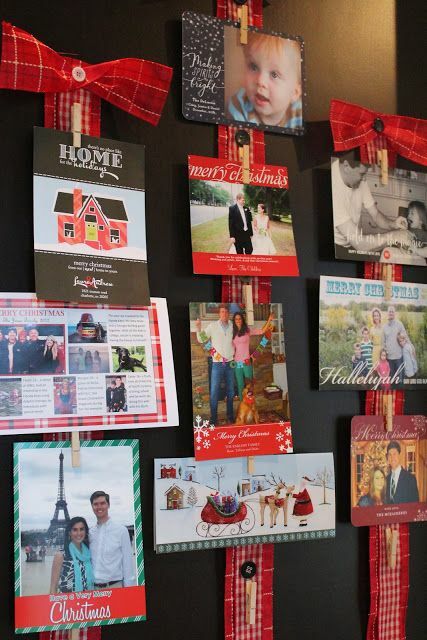 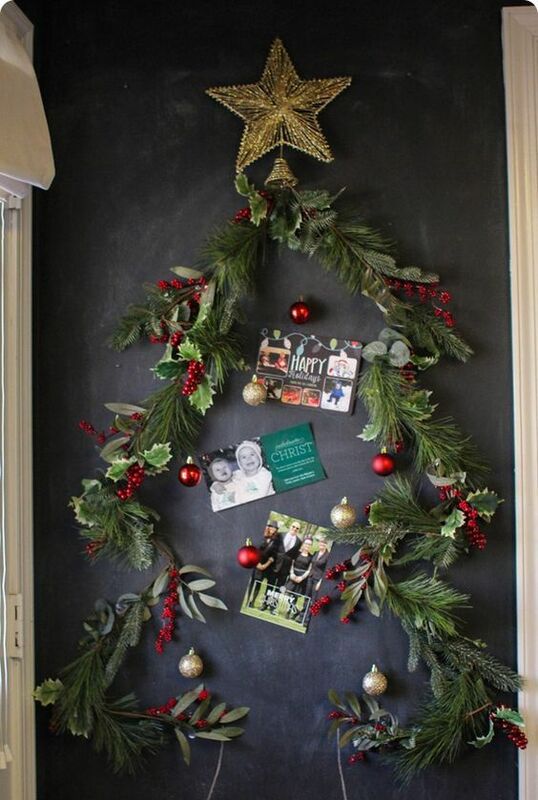 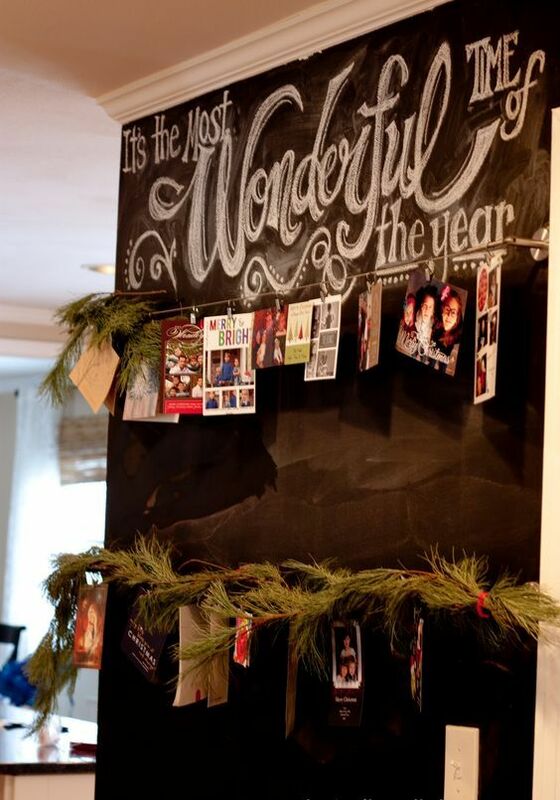 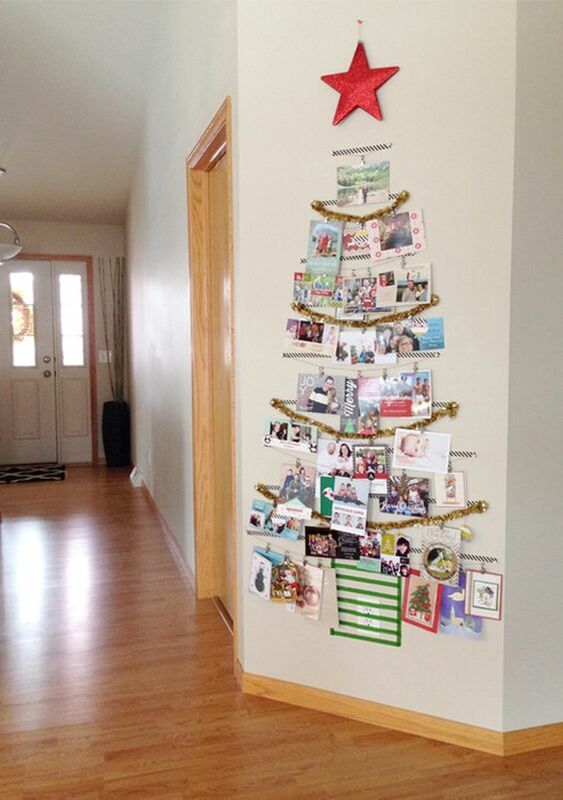 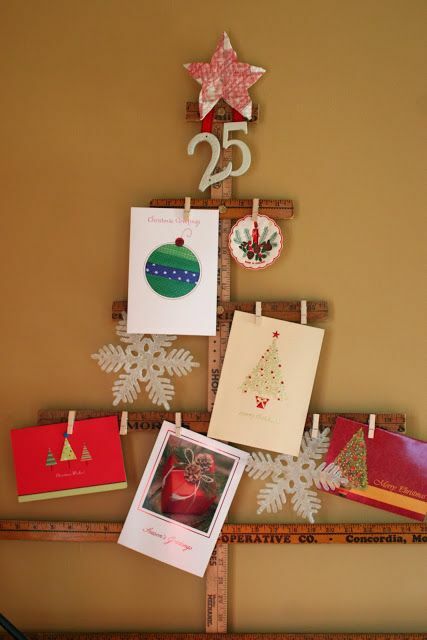 Create a Christmas card display shaped as a tree, you can do that using different materials. 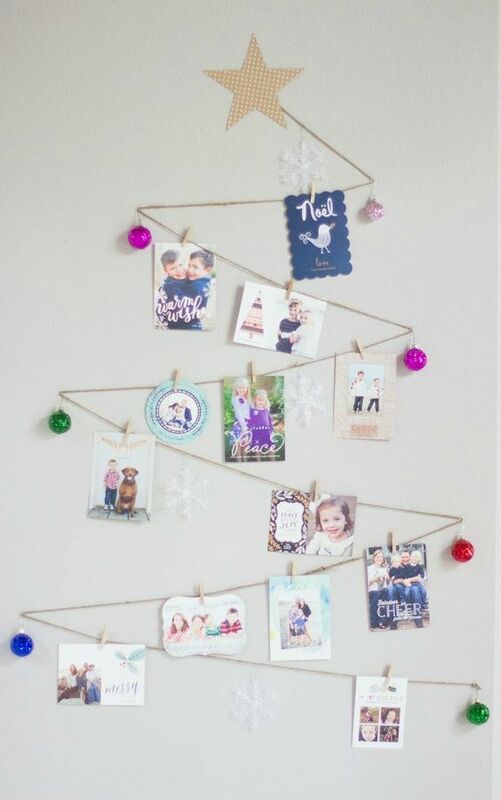 Hang chain, a light garland, an evergreen garland or some washi tape on the wall in a tree shape, it can be of straight lines, just a contour or a zigzag. 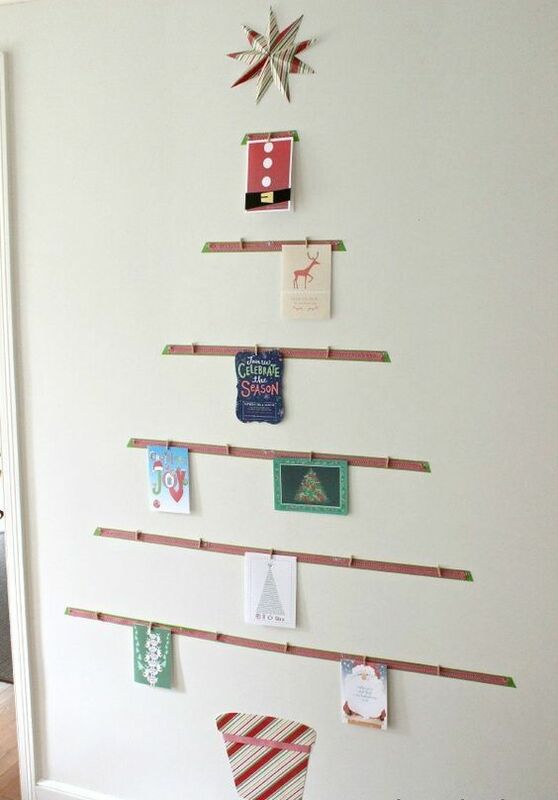 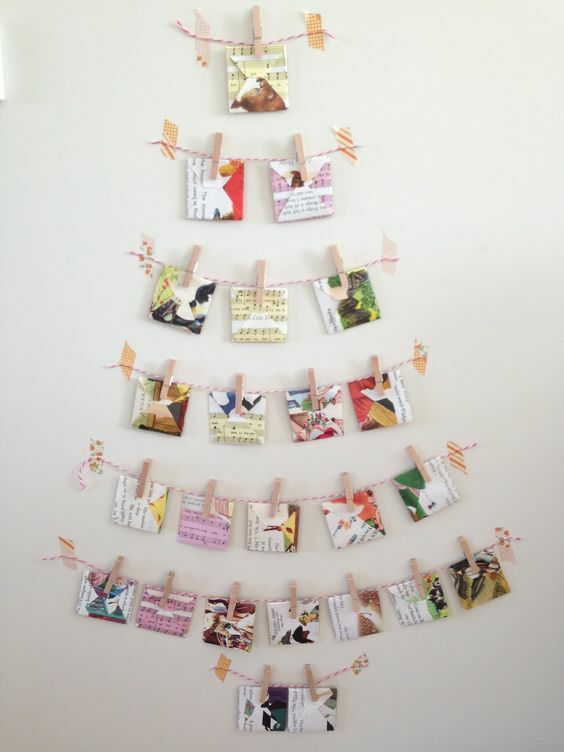 Then just attach the cards to the shape on the wall using washi tape or clothes pins; another idea is to attach only cards in a tree shape. 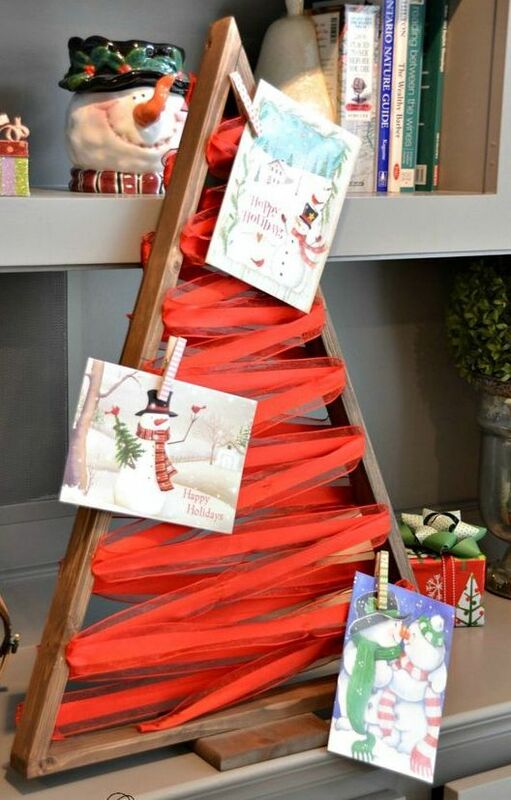 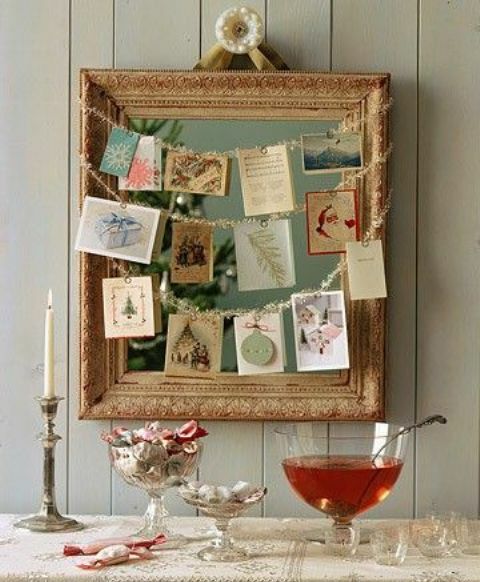 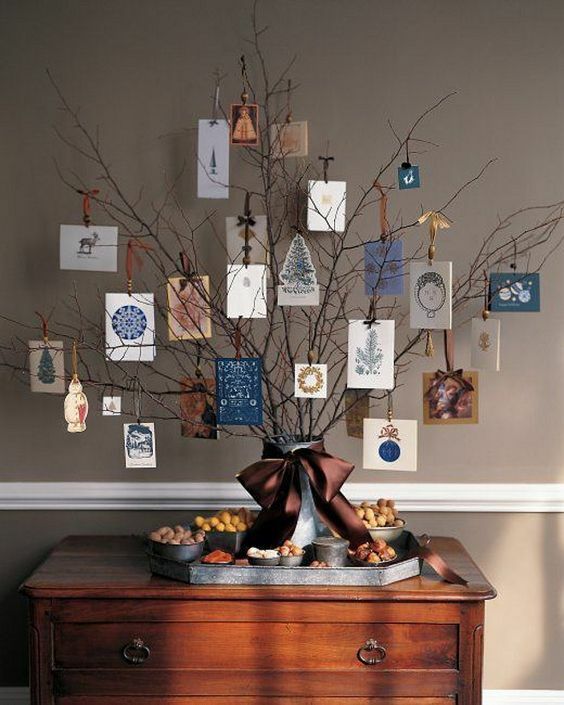 You can also make a tabletop tree of a wooden frame, cover it with ribbon or twine and attach cards to it. 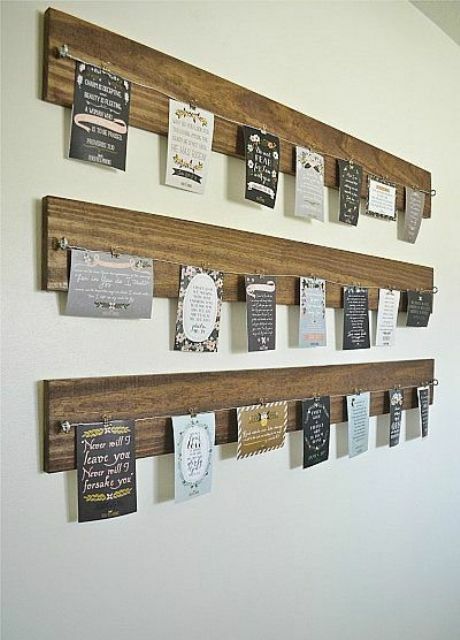 Hang all the cards on some board or a framed piece. 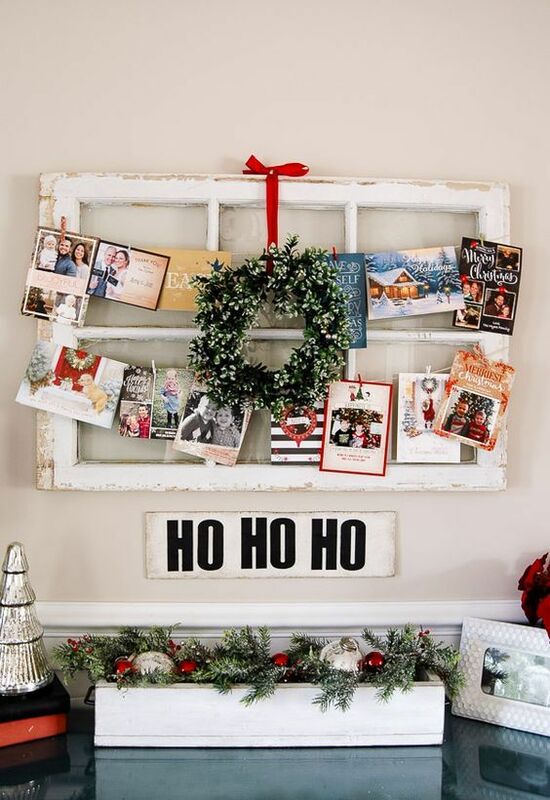 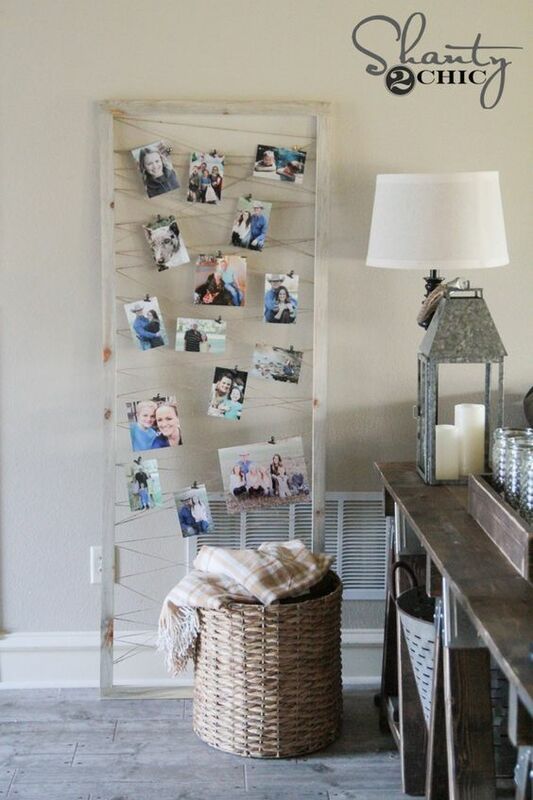 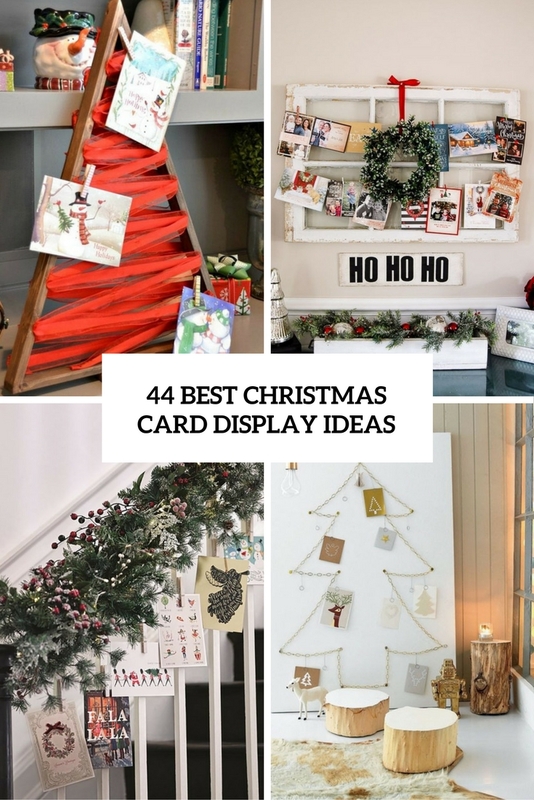 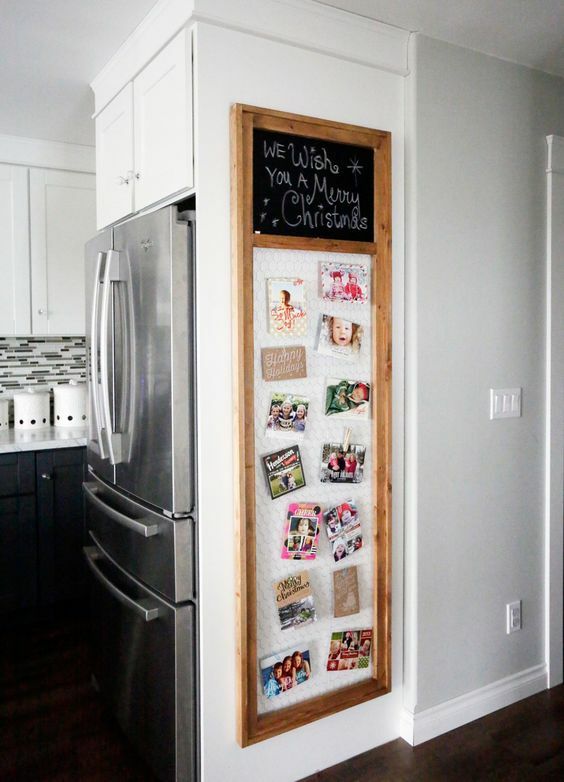 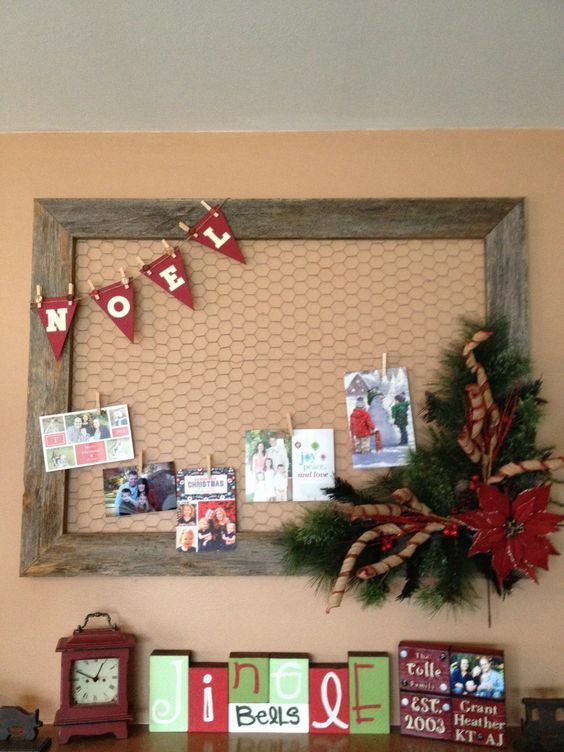 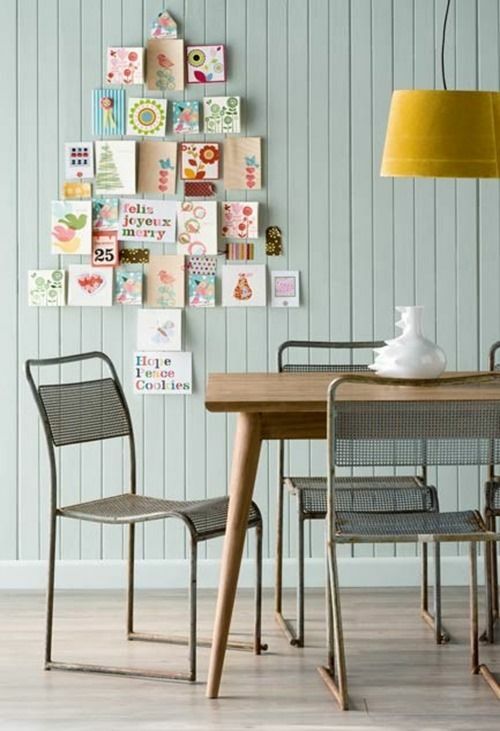 It can be a memo board that you usually use for notes, a framed piece with chicken wire inside, a framed mirror, a pallet board or an old window frame covered with lights or garlands. 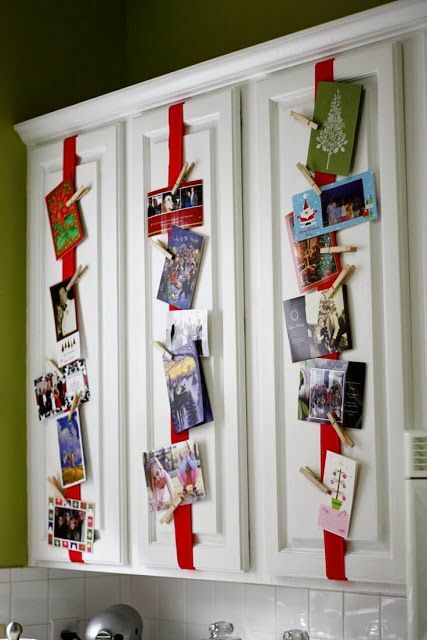 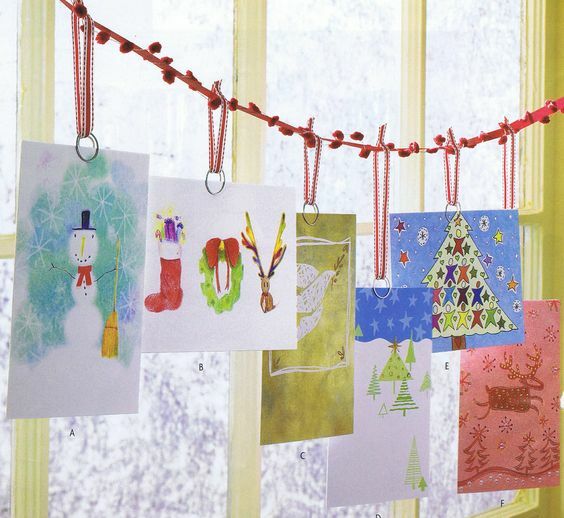 Attaching cards can be different: hang them on garlands with clothes pins, attach them with pins to a pinboard, or to the chicken wire with clothes pins. 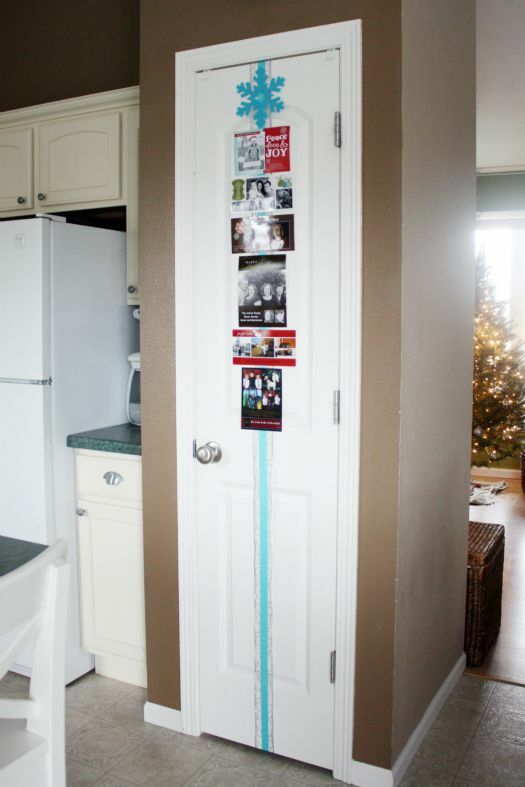 Hanging photos can be different: you can hang them on fabric or tape strips and attach them to doors and walls. 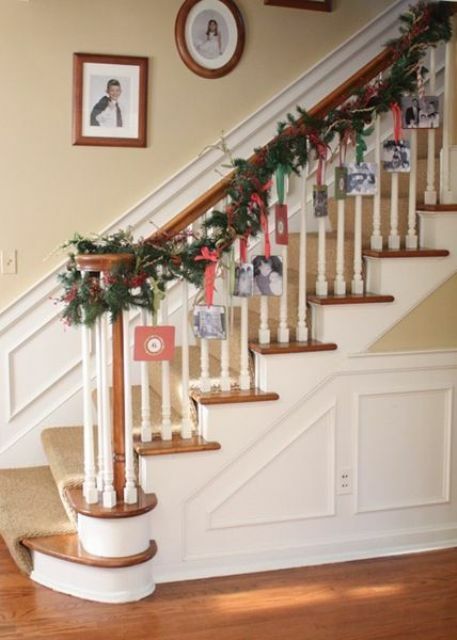 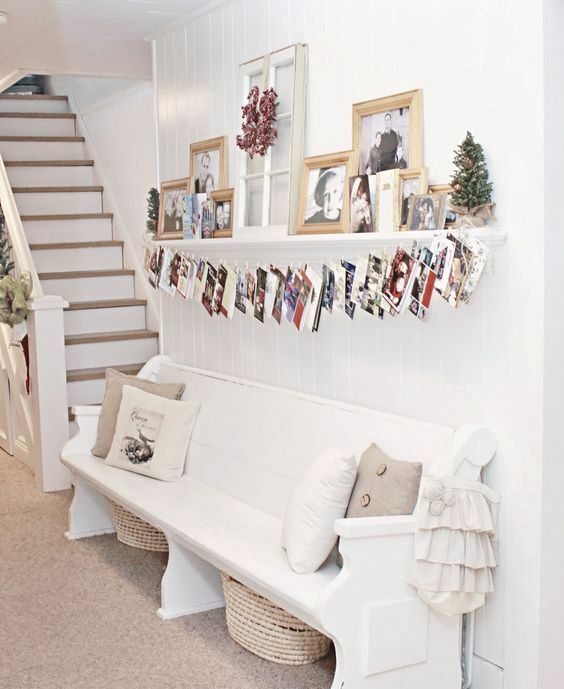 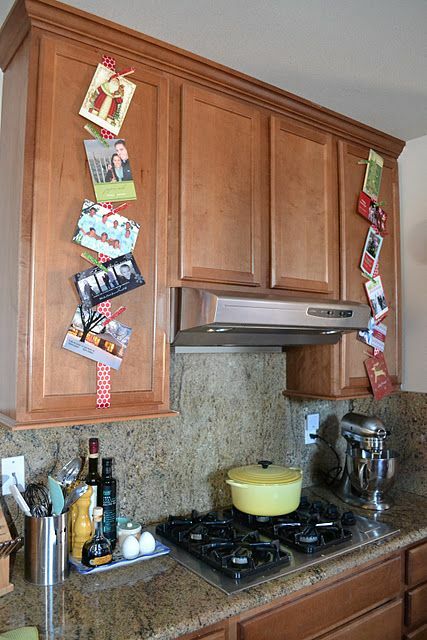 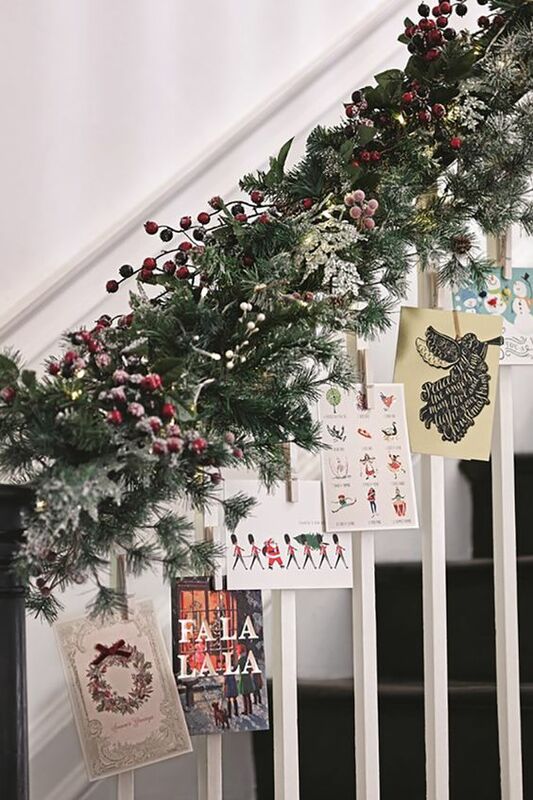 Another idea is hanging garlands or threads and then attach cards to them; you stairs shouldn’t be left undecorated, hang cards on ribbon on them. 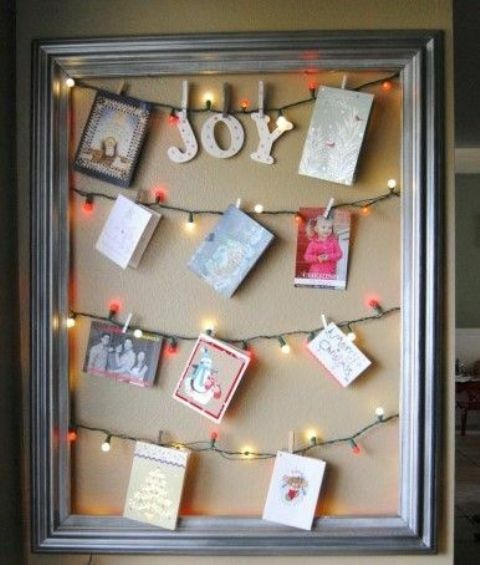 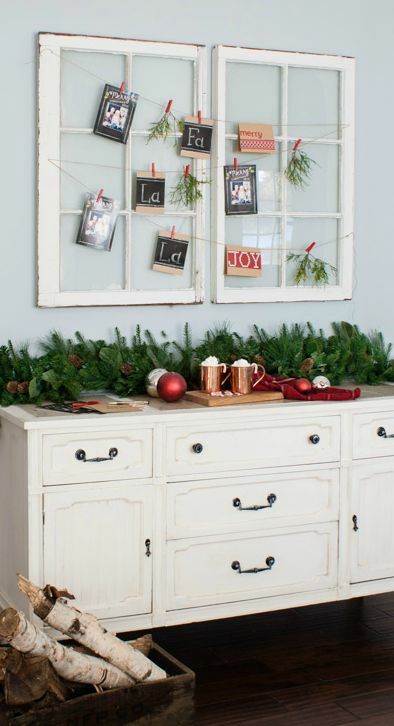 Cover the entry with an evergreen garland and attach cards right to the garland, you may also add lights and pinecones. 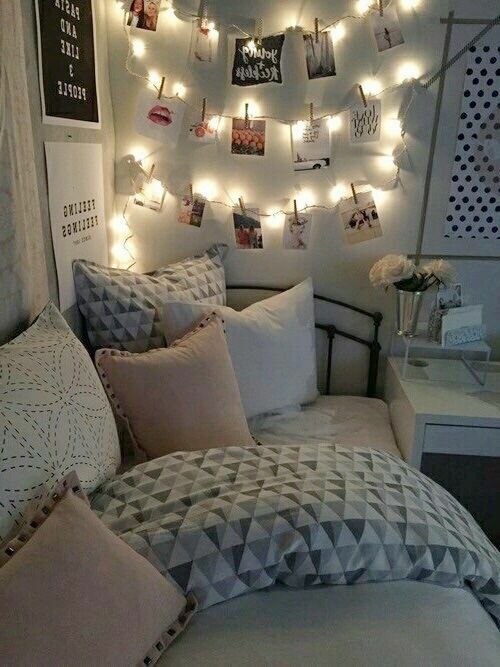 Turn on your creativity! 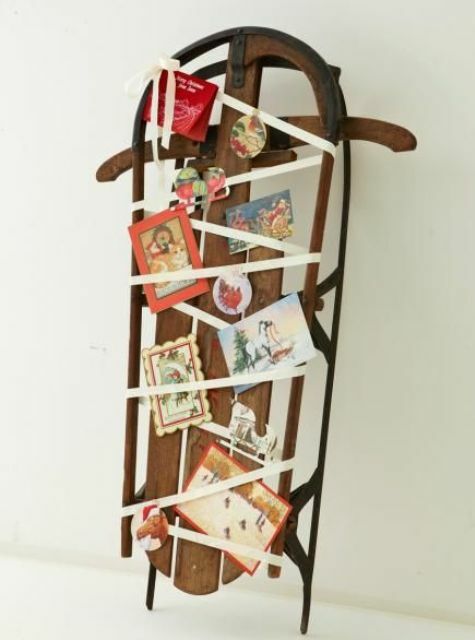 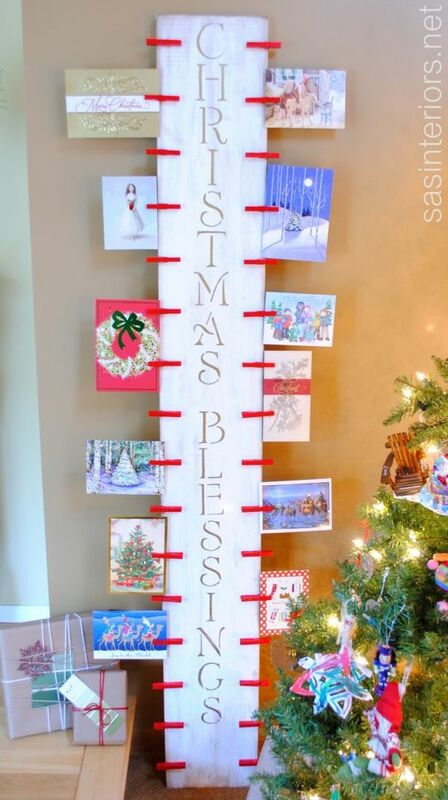 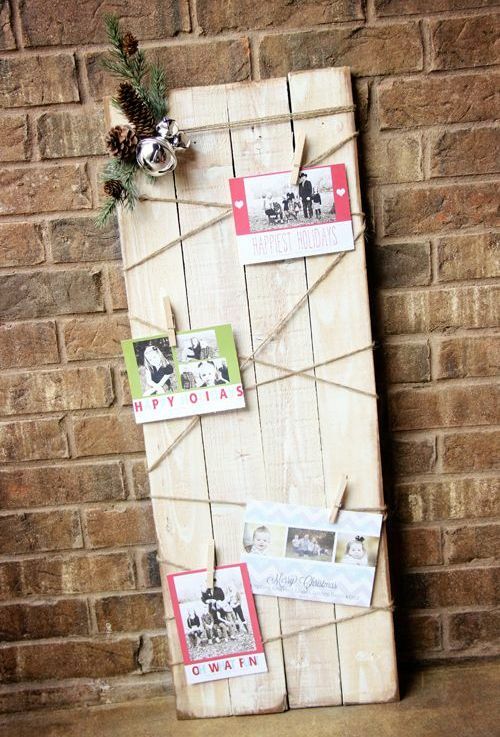 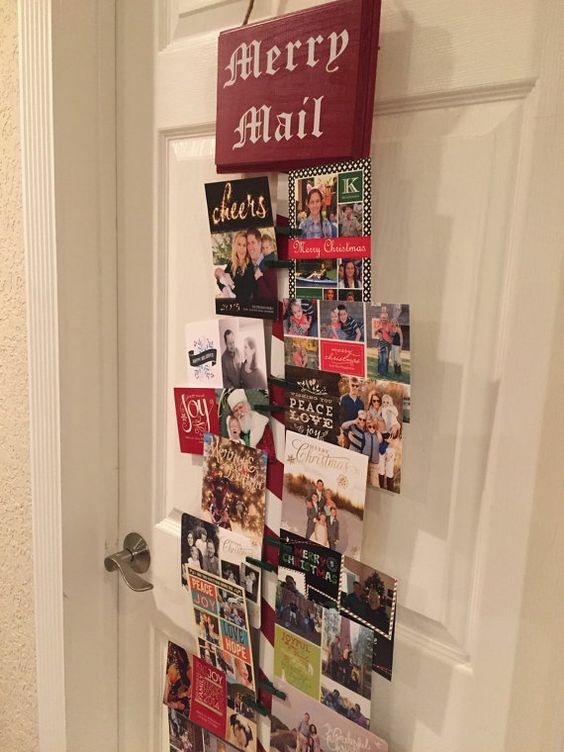 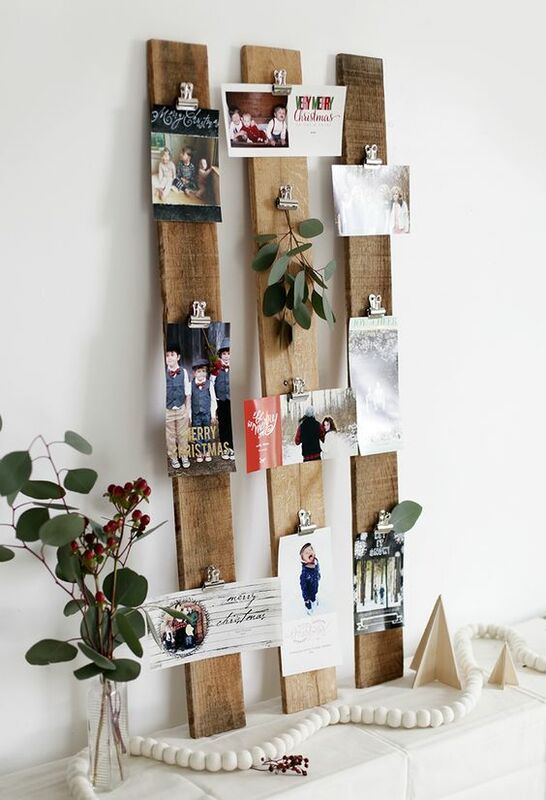 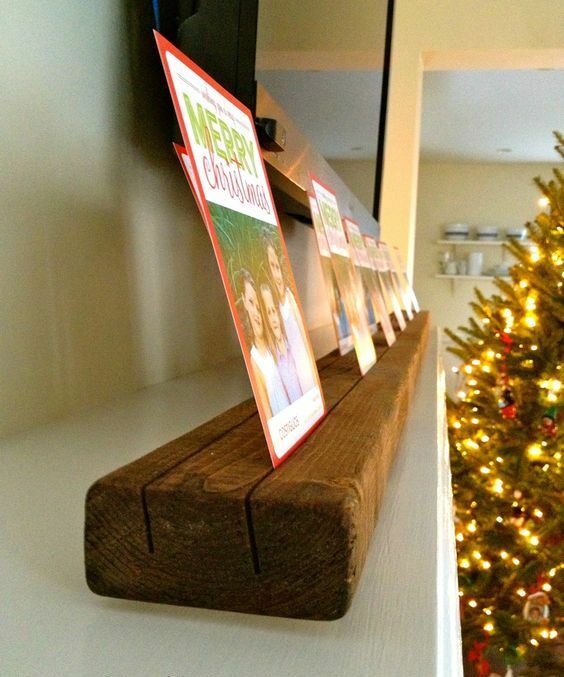 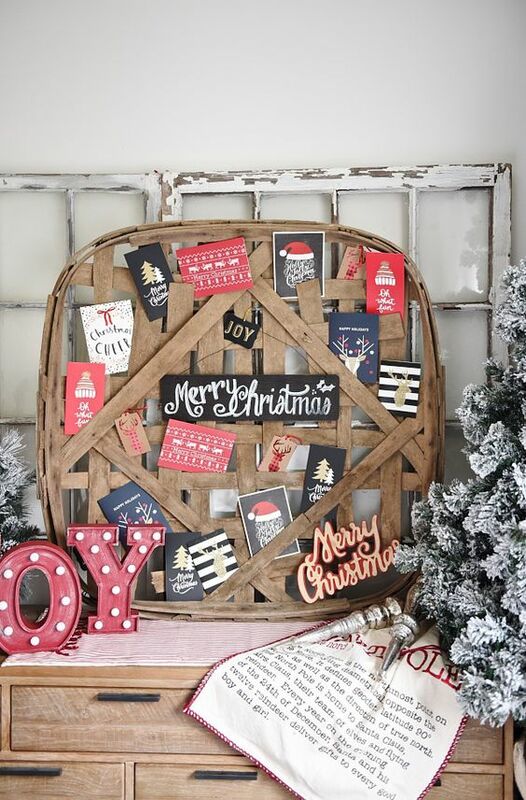 Display your cards and pics on skis, a sleigh, tree branches, a tobacco basket, signs, wooden logs and so on. 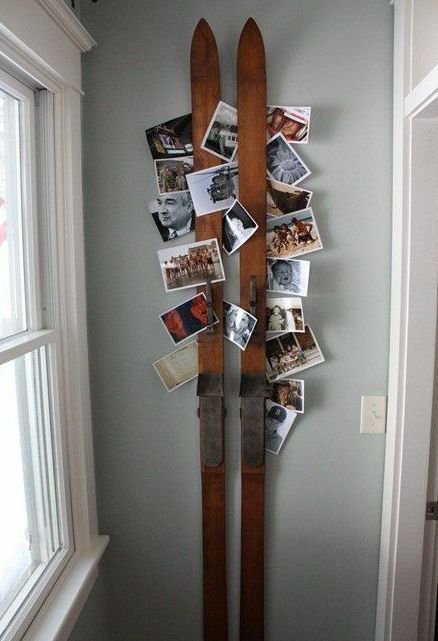 There are no limits for your imagination!